In March 1980 The Tallis Scholars made their very first recording for the Gimell label, a celebrated programme that included Allegri’s ‘Miserere’ (see review). Since then the Gimell label has issued a steady stream of acclaimed recordings by the ensemble and the Gimell story is one of consistent success and artistic excellence. (See anniversary interview with Peter Phillips and Steve Smith, the founders of the label). This new CD, which is timed to celebrate the thirtieth anniversary of that first recording, also happens to be the fiftieth new recording on the label. Superficially, one might have looked for such an anniversary release to consist of music that is more obviously celebratory in tone. However, though the music recorded here is solemn in nature the disc can be said very fairly to be a celebration of the core virtues both of the label and of The Tallis Scholars, as exhibited in so many previous recording from this source. Thus the quality of the performances is absolutely excellent. Furthermore, though there’s nothing remotely stuffy or academic about the music making, the performances are clearly rooted in very sound scholarship. Then there’s also the extremely good recorded sound to consider and the high calibre of the documentation. In short, this CD is fully up to the long-established traditions of the Gimell house. The three days leading up to Easter Sunday – Maundy Thursday, Good Friday and Holy Saturday – have always been days of special significance in the Christian church. In the Roman Catholic tradition these three days – the Triduum – are marked by liturgies of special solemnity during which the Passion and Death of Christ are marked and contemplated prior to the celebration of the Resurrection. Naturally, much of the liturgical observance during these days is meditative in nature. Nowhere was observance of the solemnity of the Triduum more marked than in Counter Reformation Spain and the music recorded here is suitably intense and thoughtful. Victoria composed this music to be sung at the office of Matins on each of the three days. As Peter Phillips points out in his very interesting notes, in the music here recorded Victoria set the scriptural readings, all from the Lamentations of Jeremiah, that were prescribed for the first Nocturn at Matins. Each of these lessons would have been followed by a sung Responsory. Victoria composed settings of the Responsories of the Second and Third Nocturns (recorded by The Tallis Scholars on CDGIM 022), but not for the preceding lessons, whereas for the first Nocturn he set the lessons but not the Responsories. 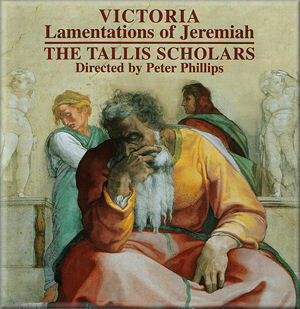 The Lamentations are recorded here in an edition by Jon Dixon. There are three for each of the three days and every one ends with the poignant phrase ‘Jerusalem, Jerusalem, convertere ad Dominum Deus tuum’ (‘Jerusalem, Jerusalem, turn to the Lord your God’). These phrases bring a musical and literary unity to the music, though it’s very important to remember that originally they would not have all been heard together. However, I think there’s a very strong case for hearing them as a sequence. Indeed, as I listened it struck me that in these pieces we almost get something of a microcosm of the Triduum, even if the texts themselves, which significantly pre-date the birth of Christ, make no direct reference to the events of Holy Week. Victoria’s music is wonderfully intense, very affecting and expressive. It’s also extremely beautiful. Peter Phillips and his gifted singers perform them outstandingly well, realising marvellously what Phillips refers to as the “plangent austerity” of the music. As one listens everything sounds so natural and inevitable as Victoria’s long phrases unfold. Technique such as this is the result of what must have been painstaking preparation yet the performances never sound at all studied. I was interested to read that Peter Phillips had encouraged his singers to put more intensity into the main body of the text of each Lamentation than into the ‘Jerusalem’ phrases. They certainly respond with the intensity that he sought. For example, they impart great tension to the passage in the second Maundy Thursday Lamentation that begins with the words ‘Et egressus est a filia Sion omnis decor eius’ (‘The daughter of Sion has lost all her beauty’). Later on, sample the depth of feeling in the singing of the words ‘Ego vir videns paupertatem meum’ (‘I am the man who has seen affliction’), which occur in the third Good Friday Lamentation. The third and last Lamentation for Holy Saturday is a little different in that the text is an overt prayer. This is the longest of the nine pieces and it’s a heartfelt supplication by the prophet. The Tallis Scholars reserve some of their most fervent singing for this piece and it’s as moving as anything you’ll hear on the disc. In addition to Victoria’s music we’re offered the Maundy Thursday Lamentations by Juan Gutiérrez de Padilla. He is an interesting character, one of a host of Iberian musicians who journeyed to Latin America in the sixteenth- and seventeenth centuries to assist in the evangelisation of the New World through the provision of liturgical music in the many churches and cathedrals built by the conquistadors. It’s not known exactly when Padilla emigrated but by October 1622 he was cantor and assistant Master of the Music at the cathedral in Puebla, Mexico and seven years later be was promoted to the post of Maestro de Capilla at the cathedral, a post that he held until his death. Padilla’s Lamentations, which are scored for six voices (SSATTB), are performed in an edition by Bruno Turner. I don’t think that Padilla quite matches the intensity of Victoria’s settings but the music is still very impressive indeed and once again it’s performed with The Tallis Scholars’ fine mixture of finesse and commitment. I noted in particular the very powerful singing of the passage beginning at ‘facta est quasi vidua domina gentium’ (‘the queen of nations has become as a widow’). Later on, at the words ‘Migravit Judas propter afflictionem’ (‘Judah has departed because of torment’) Peter Phillips moves the music forward with significant purpose and there’s real bite in the singing. Throughout the whole set of Lamentations he and his expert singers serve Padilla’s music very well indeed. For these performances The Tallis Scholars consists of twelve singers, four to each voice, with the alto line shared between two male and two female singers. Throughout the whole programme the standard of singing is of the very highest order. Tuning, blend and ensemble are immaculate. The voices are balanced impeccably and the diction is admirably clear. Furthermore, the recorded sound that engineer Philip Hobbs has produced is really lovely and pleasingly atmospheric. He has managed to convey an aural image that is at once spacious yet intimate, giving a very clear and present sonic image of the singers. As I indicated earlier, this CD is in the best traditions of the house. It is, in short, an outstanding release that celebrates the thirtieth anniversary of Gimell in the most distinguished manner possible.